Rice terraces in Jatiluwih, Bali. It's impossible to escape rice in Bali. It is literally everywhere. 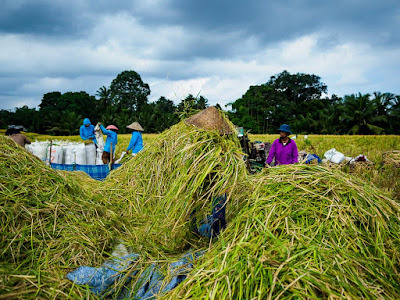 You see rice growing in urban Denpasar, near the international airport, on your way out of town. It's on almost every plate of Balinese (or Indonesian) food you order. 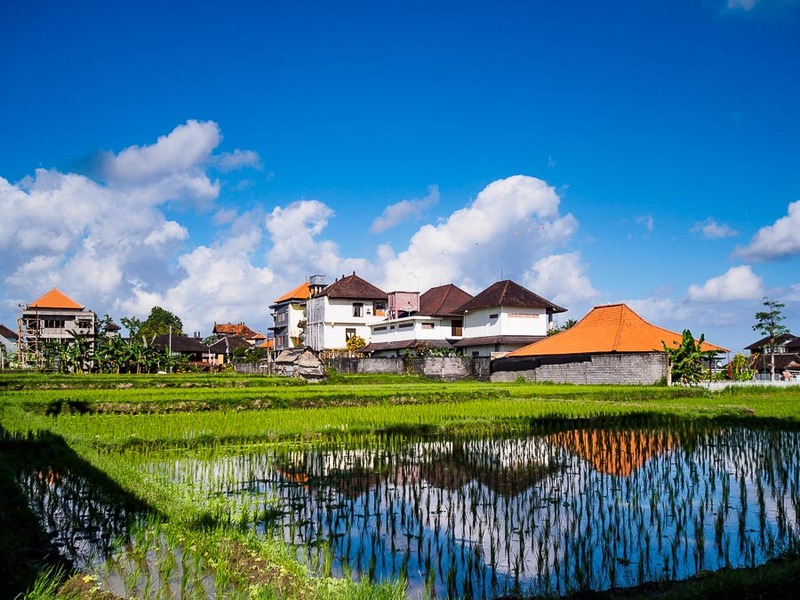 There are fields crammed between hotels in Ubud. There are so many rice fields in the countryside that other crops seem startlingly out of place. 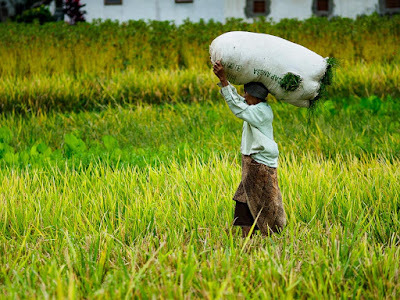 A woman carries freshly cut rice out of a field near Jatiluwih. I've photographed rice farming in every trip I've made to Bali and I promised myself I wouldn't do it this time. But like so many promises one makes to oneself, this one was forgotten as soon as I started a trip across the island. A farmer tills his field. 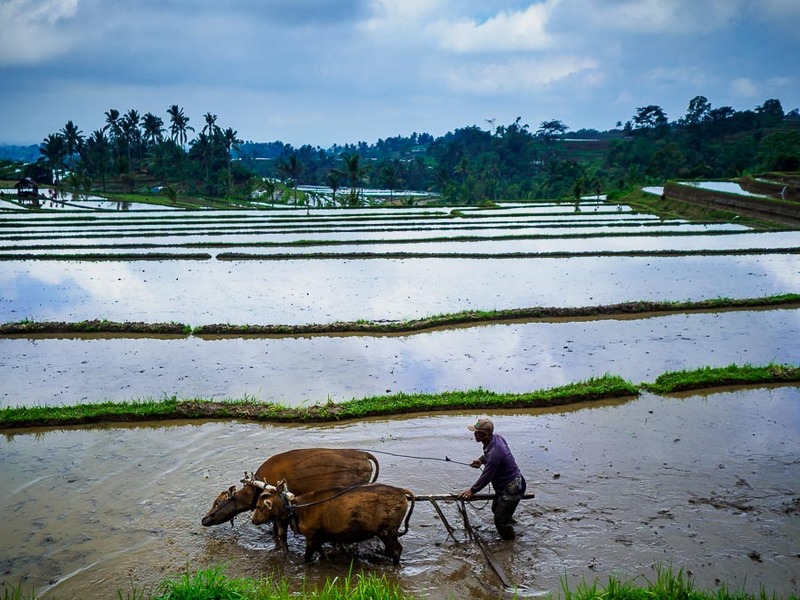 Mechanical tillers are making inroads in Bali, but most farmers still work with water buffalo and oxen. The rice fields are like catnip to photographers. For landscape photographers, there are great vistas, endless fields of emerald green. For photojournalists there are photographs of people toiling to eke out a living under difficult circumstances. Farming in Bali not like industrial agriculture in the United States or even Thailand. This is farming as it's been practiced for millenniums, since man first domesticated beasts of burden. This is the way agriculture is still done in much of Asia: Cambodia, Laos, Myanmar, India. It wasn't until late 20th century that Thai agriculture became mechanized. While another, under the conical hat, surrounded by chaff, sorts rice. Even portable mechanical threshers are unusual in Bali. Jatiluwih may be more prosperous than many villages because it collects an admission fee from non-Indonesians driving through the terraces. 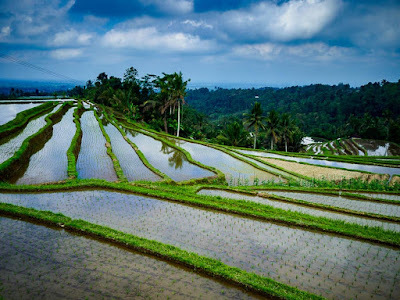 Rice farming is changing even in Bali though. Mechanization is creeping in. There aren't many tractors yet, but small mechanical tillers are more common. The real danger is real estate speculators. It seems like every foreigner who comes to Bali, whether as a tourist or retiree, wants to stay in the middle of a rice field. This is driving up land prices and many farmers (or villages, if the land is communally owned) are selling or giving long term leases to developers who want to build villas in the rice paddies. In central Ubud, a rice field surrounded by tourist housing. "Downtown" Ubud is just behind the new construction in the background. 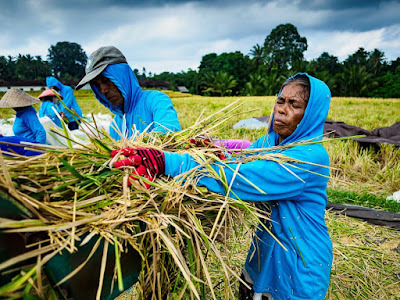 There are more photos of rice production in Bali in my archive. Most of the photos in my archive are available for editorial use or self fulfillment as prints. If you see something you'd like to use or just hang on the wall, click on the "Add to Cart" button and follow the onscreen prompts.